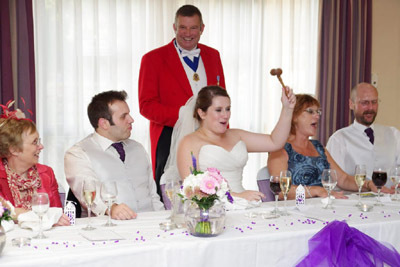 By using the services of a Toastmaster at your wedding ceremony and reception, you can be assured and confident that everything will run smoothly. 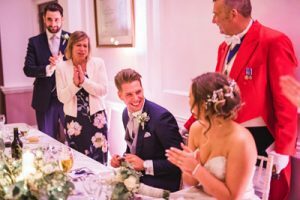 Add elegance and style to your wedding day or that very special occasion with discreet guidance and advice from a professional toastmaster. About 4 weeks prior to the wedding, I will contact you to find out how you want the various aspects of the event to be organized. On the day, I will be there to greet you and your guests when you arrive and from that moment, everything will be organised in a quiet way, on your behalf, so that everything runs in exactly the way you want. 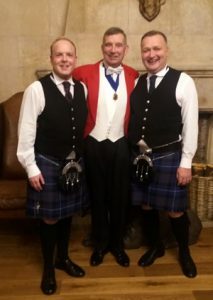 This is your special day, and the Toastmaster will try and make sure that it is a day to remember, with the whole day being a relaxed, happy occasion for every one. After greeting you on arrival, I will: liaise with the caterers/hotel staff, photographers, videographers, to ensure the timing of the SPECIAL PHOTOGRAPHS to record the highlights. It may be that you want to formally welcome your guests in which case I will organise the receiving line, at the appropriate time. I will also assist in organising the cutting of the cake ceremony, announce the speeches and toasts of congratulations. Ensure that gifts are at hand when needed, and in general always be there on hand to assist (and advise if necessary) whenever requested by any member of the wedding party. Unlike some others I will remain with you to see that the evening runs as well as the rest day, and only leave once I am sure I have done all I can do to make sure that you remember the day for the happy and joyous occasion it has been. I have a mantra of 3F’s! The day must be FUN there needs to be an element of FORMALITY in that it starts and finishes and everything is done, but never forget it is an important day so there should be nothing FLIPPANT about the day I also has a passion to make sure that the two of you remember the day. I will slow things down, give the two of you ‘time out’, and point out the small details of the day that you may well miss. WITH THE RIGHTTOASTMASTER YOU WILL REMEMBER MORE OF THE DAY.